World-famous theoretical physicist Stephen Hawking says flat-out that he doesn't believe in God, but he does believe that space travel offers the best hope for our species' immortality. 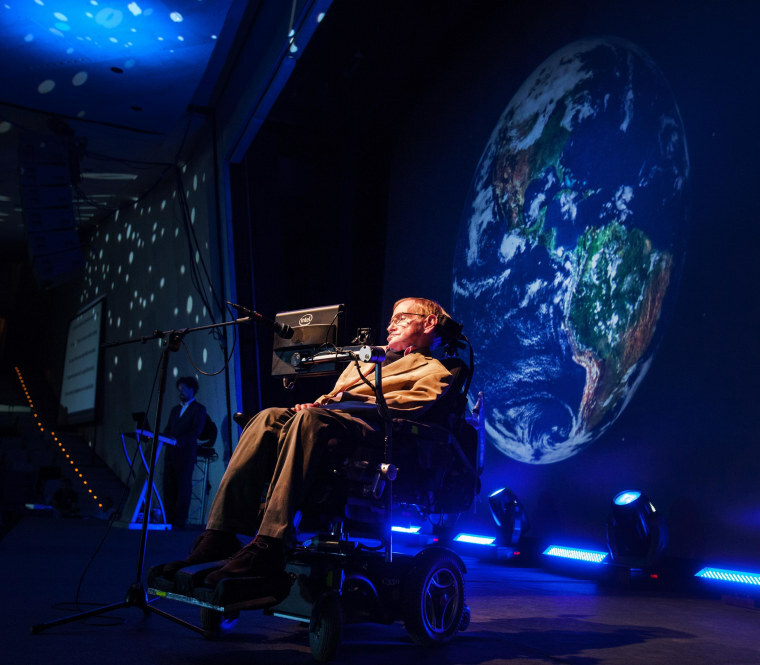 Those pronouncements came during the buildup to this week's Starmus Festival at Tenerife in the Canary Islands, where Hawking and other scientific luminaries have gathered for rounds of talks, tours and elbow-rubbing. In the past, there's been a tiny bit of ambiguity: In "A Brief History of Time," Hawking writes that the discovery of a unifying set of scientific principles known as the theory of everything would enable scientists to "know the mind of God." But in a follow-up book about the quest for the theory of everything, titled "The Grand Design," Hawking said the mechanism behind the origin of the universe was becoming so well known that God was no longer necessary. "Before we understand science, it is natural to believe that God created the universe. But now science offers a more convincing explanation. What I meant by 'we would know the mind of God' is, we would know everything that God would know, if there were a God, which there isn't. I'm an atheist." Hawking addressed the issue more delicately several years ago when he told Reuters that he was "not religious in the normal sense," and said "God does not intervene to break the laws" that He decreed. Since then, however, there's been a lot more theorizing devoted to the origin of the universe. Hawking now believes that an approach known as M-theory will eventually reveal the grand design of the cosmos. "In my opinion, there is no aspect of reality beyond the reach of the human mind," Hawking told El Mundo. Hawking's views carry a lot of weight in popular culture — in large part because his studies of black holes, the nature of space-time and other deep subjects have earned him a reputation as one of the smartest people on Earth. Another part of his appeal comes from his triumph over adversity: For decades, he has been fighting against amylotrophic lateral sclerosis, or ALS — a neurogenerative disease that's left him almost completely paralyzed. He can communicate only through a computer that's controlled by the twitches of his cheek. Despite that hardship, he continues to travel and give voice-synthesized lectures at the age of 72. The El Mundo interview says that his doctors no longer allow him to fly — which might pose a problem for his plans to fly into space once Virgin Galactic's SpaceShipTwo suborbital rocket plane goes into service. But whether or not Hawking gets into outer space himself, he sees that final frontier as a life insurance policy. "It could prevent the disappearance of humanity by colonizing other planets," El Mundo quoted Hawking as saying. There's a catch: If there are other civilizations out there, we'd better be careful not to run across the bad guys, a la "Prometheus." Hawking has previously warned against calling too much attention to ourselves, for fear of attracting the wrong sort of extraterrestrials. Such a visit might well be similar to Christopher Columbus' visit to the Americas, "which didn't turn out very well for the Native Americans," Hawking said. But how likely is it that intelligent life exists? Surely someone who's skeptical about God's existence would be skeptical about E.T. 's existence as well, right? During his own Starmus lecture, evolutionary biologist (and outspoken atheist) Richard Dawkins said the astronomical evidence suggests it's "most likely" that the universe has many forms of life — although those life forms may be on "islands separated by vast distances." "The idea that we are alone in the universe seems to me completely implausible and arrogant," El Mundo quoted Dawkins as saying. "Considering the number of planets and stars that we know exist, it's extremely unlikely that we are the only form of evolved life."